"Despite her excellent knowledge, academic skills and professional achievements, Su remains down to earth, making her easily approachable by trainees, colleagues and community members. She is an outstanding role model for future physicians, academics and young women in the community." Trained in India and England, Su also practiced in Kenya before arriving in London in 1994 to take up a position as Professor of Anesthesia at Western. Her special interest is the management of acute post-operative pain with regional anesthesia, and she is one of the leaders in the use of ultrasound in this field. She established the post-graduate training program in regional anesthesia in 1995 and the training program in ultrasound-guided regional anesthesia in 2004. Su has introduced many innovations during her time at London Health Sciences Centre, including the use of patient-controlled regional analgesia equipment, continuous catheter paravertebral blocks for minimally invasive cardiac surgery, cervical epidural anesthesia for shoulder surgery, and periarticular infiltration and infusion of local anesthetic agents for post-operative pain. As Director of Regional and Pain Research at Western, Su's dedication to high-quality research has produced more than 50 peer-reviewed articles and close to 50 presentations and abstracts. She currently holds grants totaling more than $500,000. She is a guest reviewer for several prestigious journals and granting agencies, including the Canadian Institutes of Health Research. 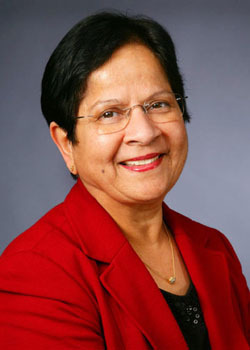 She was nominated for the PAIRO Excellence in Clinical Teaching Award in 1991 and received the University of Western Ontario Department of Anesthesiology and Perioperative Medicine Fellowship Teacher of the Year awards in 2004 and 2005, and has been an invited speaker or visiting professor at conferences and universities across Canada and around the world. By pushing back the boundaries of knowledge and daring to innovate, Dr. Sugantha Ganapathy eases pain and improves care for patients everywhere.